We're barely a month out from the exciting follow-up to last year's smash Avengers: Infinity War; what better time to take a look at some of the characters who appeared in that film, however briefly? As an agent of espionage and expert in hand-to-hand combat, Black Widow is trained to take out any enemy of justice. One of the better aspects of Infinity War was how it managed to juggle so many characters within its epic narrative and still give most meaningful screentime. Most, that is. Natasha here was somewhat under-served, with only a few small sections to Black-Widow it up, culminating with the three-way designated girl fight. That said, her introduction was strong and it was a nice allusion to the comics (specifically, to the other Black Widow, Yelena Belova) to have her donning the blonde look here, taking on an alternative appearance with the others on the run following the events of Civil War. With the opening pleasantries out of the way, I have to say that this is one of the best Marvel Legends figures in an already incredible line. The likeness is absolutely stunning; this is Scarlett Johannson. You wouldn't get a better likeness on a 12" Hot Toy. It's that good. The impressive work on the sculpt here is bolstered by the paint, which is very impressive, getting all the minor details on the costume as well as the accessories. 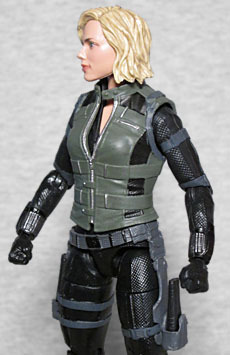 Pay special attention to the fantastic work done on her short hair, which has more detail than most Marvel Legend female figures, more detail than most figures in general. Plus, her uniform, worn beneath the new green vest, has a tiny tiny texture running all over the arms and the outside of the legs. This is very impressive stuff. Made all the more impressive by excellent articulation; find Widow really embracing the "super" part of "super articulation," sporting swivel/hinge ankles, double-hinged knees, swivel thighs, balljointed hips, swivel/hinge wrists, swivel/hinge elbows, swivel/hinge shoulders, a balljointed torso, hinged neck, and balljointed head. This gives a sensational range of movement and a lot of incredible poses. 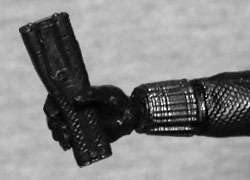 While some joints seem to be missing, like swivels for the biceps, it doesn't get in the way of the movement you get out of her. Great work. 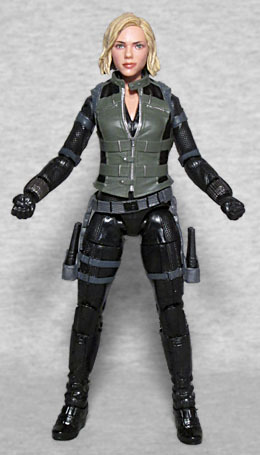 Black Widow is also loaded with accessories; starting from the top, she has alternative hands which pop off and on easily, making fists or with open hands, in order to handle her terrific weapons. First up, she has the new holstered weapons that were designed to replace her guns, but then never got used in the film. Whoopsie! Allegedly they can do all sorts of wonderful things, other than tase people, but we'll have to wait for Endgame to find out. She can hold the things, or they fit snuggly into the holsters on her hips. 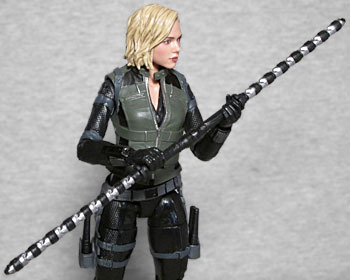 Secondly, she has the upgraded versions of the electroshock batons she used in Avengers Ex Machina, which she can handle as either separate weapons, one per hand, or fit together to make one long weapon. 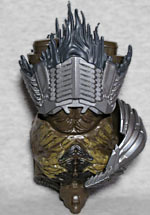 In the concept design, the silver sections would have been flexible, allowing the weapons to work like whips as well as staves, though that didn't make the final cut. These accessories share the same great paint and detail that makes this one of the better mass market figures we've encountered. But it doesn't stop there! She also includes the bulky torso section of this series' amazing Build-A-Figure, Cull Obsidian, a very big chunk of plastic with just as fantastic a detail as everything else here, one that's so big it has to be packaged upside down to even fit in the tray! 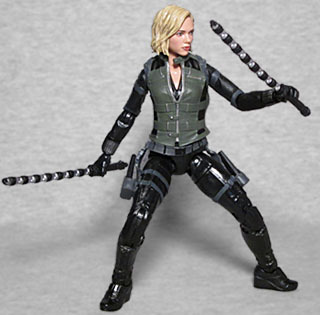 This is an all-out great set and, for my money, the best Black Widow figure we've seen so far. Hopefully Natasha has more to do in Endgame; we will soon find out!